WalkWise is a fitness tracker, safety monitor, and conversation-starter all in one! We designed it so that the walker user doesn’t need to do a single thing, yet families and caregivers still receive all the incredible benefits. Walking is mankind’s best medicine, but all too often older adults do not get enough exercise throughout the day. It’s just as important for 80-year-olds as it is for millenials! What’s more, you only get credit for walking when you use your walker, encouraging walker use 24/7 and reducing the risk of falls. Even if you never check the app, you know you’ll be alerted if something goes wrong. Falls, inactivity, no wakeup, low activity, excessive nighttime walking, and more! See below for more detailed information on our alerts and how get them delivered to your devices or phone line. Do you know how your loved one’s day is going? What about if they got to meals? With our in-depth data, you’ll never have to wonder if they’re not getting around. With our patent-pending algorithms, we can even help determine if they might have a urinary tract infection. Download the mobile app on iOS or Android! If the walker doesn’t move for a number of hours during the day. Either they aren’t using their walker, or there might be something wrong. Make sure you know immediately if a fall occurs where the walker tips over (side to side, not front to back). You can set this alert just during the night, or 24/7. Strokes and heart attacks are most common at 6:30am. If they don’t get out of bed by a set hour, you’ll get an alert. Low activity can be the sign of illness, infection, or depression. Set an activity threshold for the day. A symptom of urinary tract infections is excessive bathroom use. WalkWise estimates the number of times they get out of bed at night, so that you can catch issues before they result in hospitalizations. Download the WalkWise App to see how easy it is to configure alerts and messages! Get Alerts via Push Notification, Text Message, Automated Phone Call, Email, or all the above! Connect the Node to a WiFi network, and get a constant stream of data without having a smartphone around. The Node comes included in every WalkWise box. Follow the “Connect a Node” workflow on the app to scan for your network and enter the WiFi password. After you do this once, you should never have to do it again. If you have any smart home devices, you have likely already gone through this simple process. Place the Node in the bedroom to capture as much nighttime activity as possible. One Node should cover most houses, but if you need additional Nodes, we can supply them for a low one-time cost. 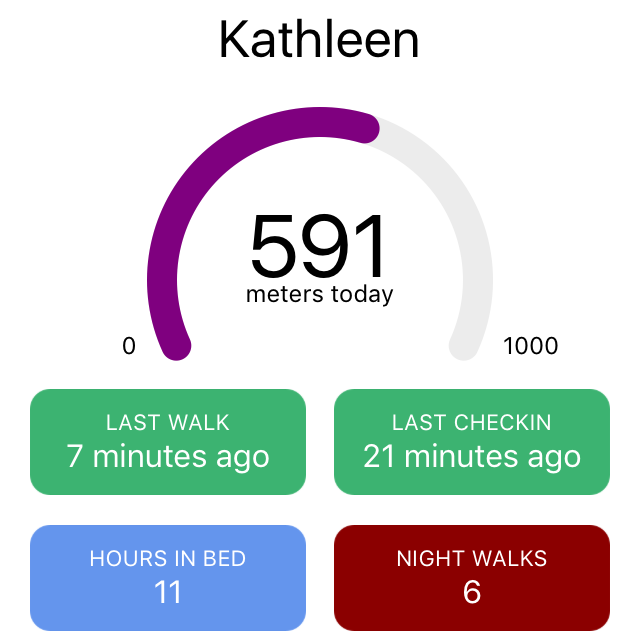 WalkWise will store walking data on it when you are out of range of a Node. Going to the store, church, or on vacation? Take your walker and you’ll get credit for the walking you did while you were away. 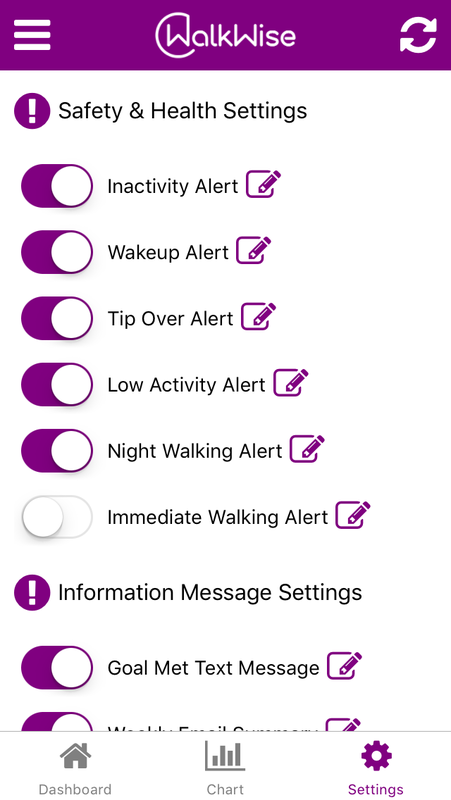 Note that most alerts will NOT send when WalkWise is out of range of the Node. We know that people get around, and we try to limit false positives as much as possible. Each WalkWise comes with it’s own password, but multiple accounts can have access to a single device. Each account can set up it’s own alerts. For example, a Home Health Nurse might get alerts about excessive bathroom use at night, while a family member might get alerts about the walker being tipped over. WalkWise uses two AAA batteries, which are accessible without uninstalling WalkWise from the walker. Use a phillips-head screwdriver to remove the two battery covers, and simply replace the batteries. Brand new batteries typically last 6-12 months. You can turn on the “Low Battery Alert” to be notified when the batteries need to be changed. Yes, we used to be called WalkSmart. We recently changed our name to reflect the wisdom of our system and the population which we serve. Plus, we created a very nice alliteration. 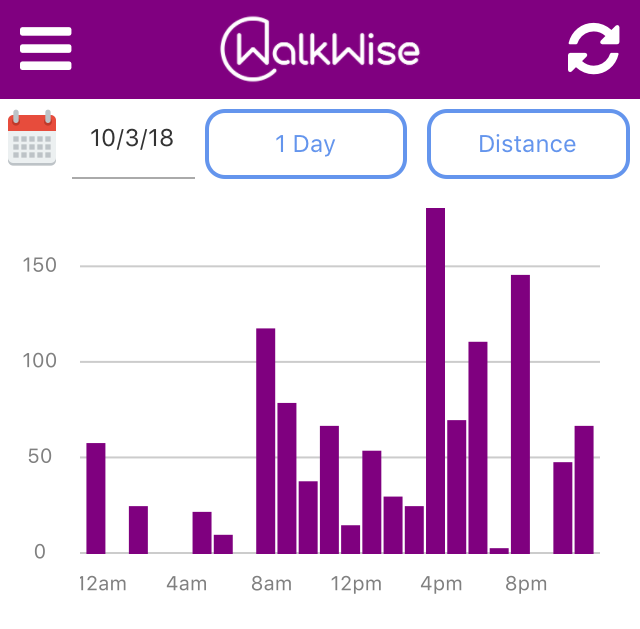 If you have a WalkSmart device, it will still continue to work and you can use the WalkWise app, too! 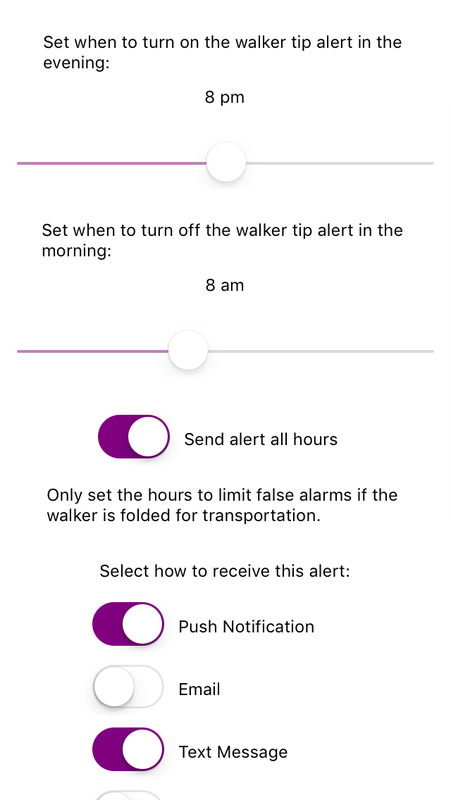 Some features, such as the tip-over alert, are brand new to WalkWise. Talk to us if you would like to upgrade for free! Our low-cost monthly subscription ensures that we can send you safety and health alerts 24/7 via phone call, text message, email, or phone notification. Emergency response pendants will cost $30-70 per month (though we highly recommend them! ), and most elaborate home monitoring systems can cost over $100 per month (which we recommend only in extreme cases). WalkWise provides all the features detailed above for only $14.99 per month. When compared to the cost of extra care or a preventable hospitalization, it’s a true bargain. Do you need helping finding a walker that will work for you? Do you want to make sure that your walker will work with WalkWise? Check out our guide! 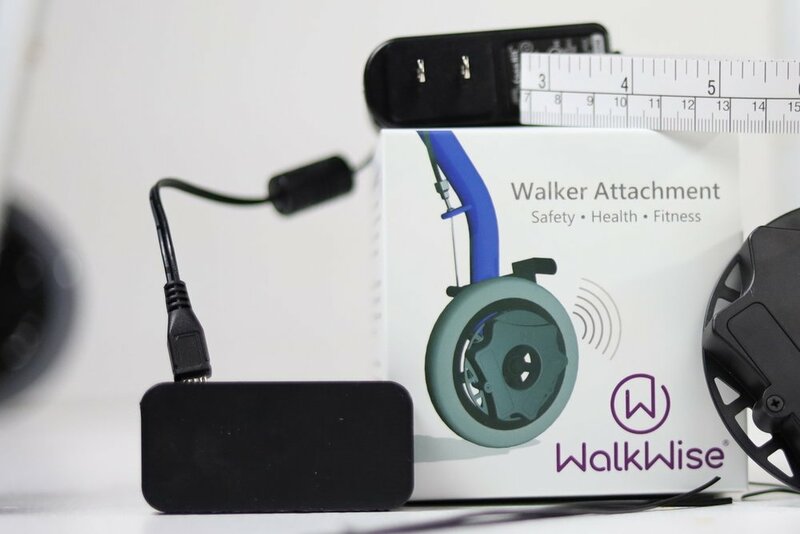 WalkWise shown attached with the included wires to a rollator walker. WalkWise shown attached with included dual-lock to a solid wheel on a traditional walker.